Member for Northern Tablelands, Adam Marshall, is the NSW Minister for Agriculture and Western New South Wales in the new Berejiklian- Barilaro Cabinet. Agriculture Minister and Member for Northern Tablelands, Adam Marshall with Gwydir Mayor, John Coulton. “The primary industries sector in NSW is incredibly rich and diverse, contributing around $3.42 billion a year, employing more than 63,000 people directly across 46,000 farming businesses,” Mr. Marshall said. “There are some obvious challenges confronting the sector right now, chief among them one of the worst droughts in living memory. This will be one of my first and key focus areas, along with addressing the issues of illegal trespass, invasion of privacy and protecting our farmers’ interests in planning processes. 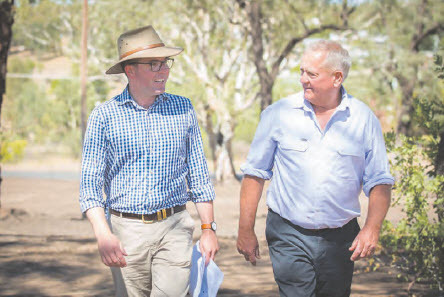 NSW Farmers’ President, James Jackson, said Mr. Marshall’s appointment came at a critical time for the agricultural industry and he looked forward to working closely with him and the Government in tackling important issues such as the drought. “I congratulate Adam Marshall on his appointment as Minister for Agriculture and Western New South Wales in the Berejiklian Government. As a representative of a regional community with a significant agricultural footprint, we hope that Adam can utilise his local knowledge to continue strengthening the agricultural sector in New South Wales”, Mr Jackson said.